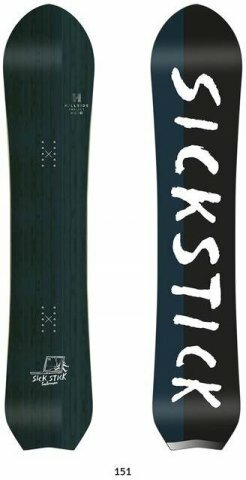 The Salomon Sickstick 151 is almost it’s own board because it’s not made as the next size down from the 157. It’s a short/fat version of the larger size SickSticks that can work for a good many boot sizes and it is one of the more Versatile short/fatties we tried. If you want something you can set back in powder but also ride switch this is a great call. Size: 151 from 2018 and a 151 from 2019. Conditions: Everything from some decent powder to good groomers. Riders: James (Size 9, 5’10” 185-195lbs), Grant (Size 11 6’ 160lbs) and Mason and Ty from Gravity Sports. Approximate Weight: Feels pretty light but not super light. Flex/Buttering: The flex of our 151 and the 2018 model 151 is a pretty snappy medium flex that to some might border on medium stiff but it doesn’t have this super aggressive flex. It can butter rather well. It’s not super easy like many boards with lots of rocker in the tip/tail but it is very doable for most ability levels. Sizing: This is the cool part about the Salomon Sickstick 151. It worked for Grants size 11’s almost as well as it worked for my size 9 boots. It could handle my 185lbs no problem and Grants 155lbs just as well. I feel like anyone who is an 8-11 could work with this ride pretty well. On Snow Feel: There is a nice stable platform underfoot that seems to enhance the stability you already get for having a good bit of camber underfoot. It is a very predictable ride in most conditions and has a really fun feel to it. It’s great for those that need to do a long flat cat track or do a good bit of one footing. It has some taper going on but doesn’t feel like it and we would say it is in that realm of Short/Fatties that look kind of surfy but have a much more double ender, balanced all mountain/one board quiver feel to it like the Ride Warpig. Edge Hold: There is a pretty strong grip that can keep the Salomon Sick Stick 151 holding an edge in hard snow. It isn’t like the Equalizer sidecut on some Salomon boards like the Assassin but it is pretty good for most conditions you want to ride in. Turn Initiation: Pretty quick edge to edge for my size 9 feet. Nothing to write home about but I never felt worried in tight spots. The smaller length does seem to compensate for the wider width. For Grant and his size 11’s he was very happy with the turn initiation but didn’t feel like he was riding a little board either. Overall its definitely on the quicker side for most boot sizes. Turning Experience: The Sick Stick doesn’t have the massive bow of camber like the United Shapes Orbit 151 that I own but it sure does have a good bit of camber going on. It is a pretty lively poppy turn underfoot that has a lot of that camber feel but not with that catchy super technical consequence. Carving: Very fun to carve and while it wasn’t a super carver it did a very good job and I could carve as hard as I could all day with this little Salomon SickStick 151. Skidded Turns: It isn’t the easiest to skid turns but its still pretty forgiving if someone like an intermediate who often skids turns, was thinking about a board like this I would say go for it. It is a far cry from those punishing camber rides I learned on back in the dark ages of snowboarding. Speed: If the conditions are good the Salomon SickStick 151 can almost hang with the 157 we rode. Uneven Terrain: Even though the dampening isn’t that good in hard micro bumps on groomers it doesn’t have as much of that small bucky feel underfoot in the bumps you find off-piste or on a messy Saturday afternoon. If you want better uneven terrain performance then it is all about the First Call 151 instead but it isn’t the worse in Salomon’s line by any means. Powder: We got some good powder with this and it wasn’t what we thought it would be for having 10mm of taper. There is pretty good float but it did feel a lot like a directional twin instead of how most freeride boards feel with the same taper. It isn’t bad or good but just different and kind of unexpected. When set all the way back on a 22″ stance width you can get 6 inches back. That’s pretty far back for a 151 with a centered stance on sidecut. You can ride this centered too and ride it switch really well. Switch: Waaay better switch than we both thought in powder and on groomers. There is something interesting going on with this design that allows 10mm of taper to act like it isn’t there when riding switch. Yeah, it isn’t a true twin but it sure feels pretty good for what it is. Jibbing: Doable but not ideal and not where I would like to take it. A little too much unforgiving snappy pop to it that doesn’t make a less than average jibber like myself want to even try it. Pipe: Super fun in the pipe and I really had a good time in the small Mt. Bachelor pipe that was up at the time I rode this. This little short fatty rode really well in there. So the SickStick is a very Unique ride and I think it has more than that quiver ride appeal. It mixes freeride and all mountain into a very doable short/fat one board quiver type of ride. if you want to try something new but still do a lot of things that many traditional length boards would do for you and possibly even more then the SickStick can work as long as you can deal with its somewhat cranky behavior in uneven terrain. We try to get as many images of the Salomon SickStick 151, but forgive us if they're not all there. I bought this board for Japan last year. Got 2days on it. This floated pretty well when centred in the light deep stuff. Set back made a difference though. Great for POW butters . I found it quick and responsive edge to edge and it handled groomers awesome. Real easy to manoeuvre and spin on jumps. I found it a bit stiff on the tail but still pressable. I ended up using my skeleton key 59 when the snow was deep in Hakuba .Bottom line this board is sick. And is great fun in all conditions except when really deep and light then you will need to set all way back .